NATO Secretary General Anders Fogh Rasmussen sees no direct military role in Syria for the alliance and warned against any stepped-up western military involvement. "I think everybody realizes that any foreign military intervention might have unpredictable regional repercussions," Rasmussen told CBS News after a White House meeting with President Obama. "And this is a reason why it's so important to focus on finding a political solution." NATO currently commands six Patriot missile batteries to defend alliance-member Turkey from cross-border missile attacks from Syria. Two of the Patriot batteries are from the U.S. The other batteries are from Germany and the Netherlands. Rasmussen made it clear NATO envisions no wider role in the Syrian conflict, despite NATO's previous military intervention - on humanitarian grounds - in the Balkans and Libya. "It is absolutely outrageous what we're seeing in Syria," Rasmussen said. "But there is a clear difference between Libya and Syria. We took responsibility for the operation in Libya based on a very clear United Nations mandate to protect the civilian population and we got active support from countries in the region. None of these conditions are fulfilled in Syria." Even so, an op-ed Rasmussen wrote for Foreign Policy and headlined "How to Keep NATO Strong" lauded the alliance's efforts in Libya where "it protected civilians against attacks by their own murderous regime." Still, the NATO leader maintained the same skittishness about military engagement expressed by the White House. Sen. John McCain, R-Ariz., recently said the U.S. was prepared to provide Patriot missiles to Jordan - the delivery of which might be precursor to a U.S.-led effort to establish safe zones or no-fly zones in Syria. The White House has said it's reviewing all military options in Syria but has expressed no specific willingness to send Patriot batteries to Jordan. 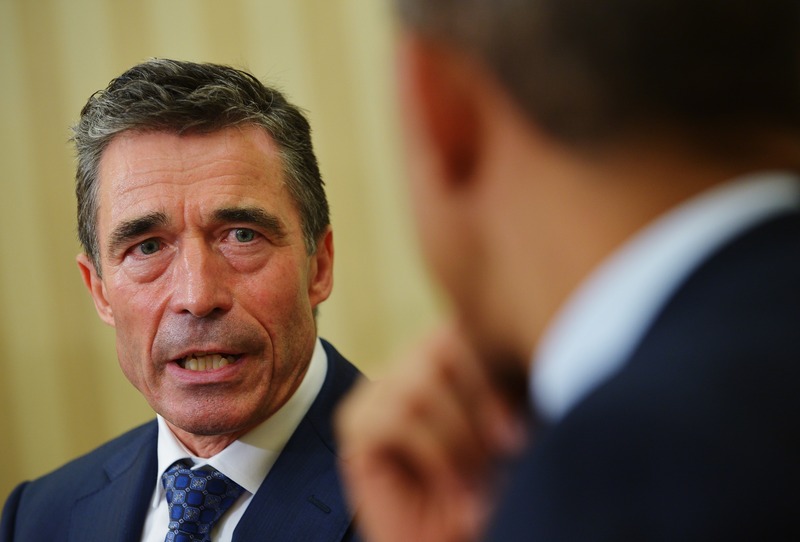 Rasmussen said Patriot missiles in Turkey define the limits of alliance assistance in the region. "Let me stress once again that NATO is engaged in defending and protecting our ally Turkey, but I do believe that the right way forward in Syria is a political solution," Rasmussen said. Incidentally, the White House, which said Tuesday President Obama intended to meet with McCain to discuss his recent trip to Syria and engagement with opposition figures confirmed Friday no meetings had taken place or were scheduled. McCain will appear on Face the Nation this Sunday. Rasmussen also said U.S. and NATO troop withdrawals are on schedule in Afghanistan and he backed Obama's recent speech on the use of drones in Afghanistan and Pakistan until troop drawdowns are complete in 2014. "I welcome the President's statement, including the commitment to a continued fight against terrorism," Rasmussen said. "As regards to drones, I don't see any difference between manned aircraft and unmanned aircraft when we're speaking about the legal aspects, and in many ways, drones can be very helpful. " The White House would not confirm this week multiple reports of a CIA-commanded drone strike killing Wali ur-Rehman, top military strategist for Tehrik-e-Taliban Pakistan (TTP). Obama's speech on his drone policy and the future of counter-terrorism strategies emphasized drone strikes would continue against Al Qaeda and Taliban figures who posed a "continuing and immediate" threat to U.S. or NATO military forces in Afghanistan. Pakistani officials have since confirmed Rehman's death.